The IBM System z9 109 has many new features that require careful planning and a comprehensive understanding of all available configuration options and tools. 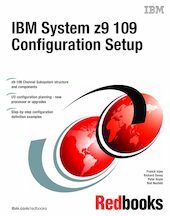 This IBM Redbooks publication will help you install, tailor, configure, and maintain this new server. - Part 1 assists you in planning and implementing a comprehensive configuration and implementation path for your IBM System z9 109. - Part 2 presents configuration setup examples, and discusses each implementation scenario in detail. The publication describes the tools and steps needed to configure the IBM System z9 109 server. It is intended for systems engineers, hardware planners, and anyone who needs to understand z9-109 system configuration and implementation. It is not intended as an introduction to mainframes, however; readers are expected to be generally familiar with current zSeries technology and terminology.